Rescue a victim from vampires. Rescue Wylandriah from a Master Vampire. Rescue a kidnap victim from vampires. The victim can be nearly anyone with a positive disposition towards you, including followers and spouses. If the victim dies, before or after rescuing them, the objective will still count as completed. If the radiant location selected is Gallows Rock there will only be Silver Hand members inside; they will also kill the vampire for you. After completing one quest for Florentius Baenius, this quest may trigger unexpectedly when you next talk with the victim. The victim may thank you as if married to you, even if they aren't. The vampire that is holding the victim hostage may die immediately when you enter its dungeon home, completing that part of the quest without your help. The victim may be your current follower. If this is the case, you can simply talk to them, then go kill the vampire that Florentius points you to. If the victim is your spouse, they may not actually be kidnapped and will remain at your home requesting help, which triggers the quest incorrectly. The target location will have no vampire to kill, so you won't be able to complete the quest. It has been suggested that this also may actually have something to do with being a werewolf, because everytime you go to the place of rescue it says you have consumed a heart without actually doing so and you don't even have to be in werewolf form. However, the "spouse" bug has occurred in cases where the player has not joined the Companions, and is not a werewolf. 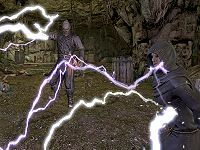 This bug is fixed by version 2.0.7 of the Unofficial Dawnguard Patch. The victim may continue on with the regular daily routine, and not stay in the dungeon with the vampire in it. If this happens, you can complete the quest by killing the vampire, then going and "rescuing" the victim wherever the victim has moved to. 10 Florentius Baenius has learned that a <Alias=Vampire> has kidnapped <Alias=Prisoner> and is keeping <Alias.PronounObj=Prisoner> prisoner in <Alias=Dungeon>. 255 Finishes quest Florentius Baenius learned that a <Alias=Vampire> kidnapped <Alias=Prisoner>. I rescued <Alias.PronounObj=Prisoner> from in <Alias=Dungeon>. On the PC, it is possible to use the console to advance through the quest by entering setstage DLC1RH06 stage, where stage is the number of the stage you wish to complete. It is not possible to un-complete (i.e. go back) quest stages, but it is possible to clear all stages of the quest using resetquest DLC1RH06. Esta página foi modificada pela última vez à(s) 01h04min de 1 de maio de 2015.